We explained in a previous article why musical instruments are tuned to the key of A? The tuning of an instrument is always based on an A (or La) to 440Hz. Unless there is a musical specificity that requires a different frequency, this is the case with baroque music, which uses a lower frequency. The table on the right lists the string frequencies of the bowed string instruments: violin, viola, cello and double bass. The higher the frequency, the higher the notes will be. They are classified from the lowest to the highest frequency, or from the lowest to the highest string. On a violin, and if you observe it laid flat from the front on a table, the leftmost string will be the G (or Sol), which is also the lowest string. Conversely, the rightmost string will be E (or Mi), and will be the highest. 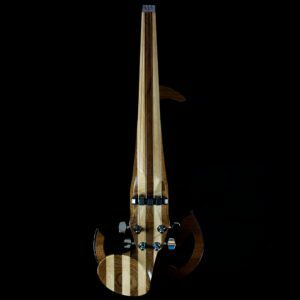 If you use a 5-string violin, the 5th string is the C string (or Do), lower-pitched than the usual G string. Actually, it’s the viola string! 2. What to tune your instrument with? 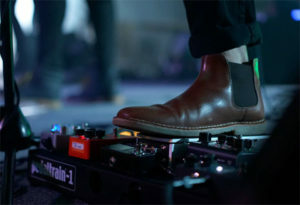 The tuner has become an essential tool for any musician. There are clip-on tuners that are fixed directly to the instrument, or small boxes that can be placed near the instrument. Tuners generally allow you to tune several instruments: guitars, ukuleles, violins, etc. They also offer different types of tuning: simultaneous (several strings at the same time) or chromatic (string by string). For a beginner, the tuner is probably the easiest tool to use. It is in a way the tuner of the old days and opportunities are rare to see a musician use one to tune. You must be able to clearly define the note you hear in order to be able to find it with your violin. This is not an easy task…. The mobile phone is now the device you always have in your pocket. There are dozens of tuner applications. Alternatively, download a piano application and refer to its A note. At 3Dvarius, we use a small application of this type to perceive the A and then tune each string. Of course, this only works if the other instrument is well tuned on the desired reference note. Some effects processors include a tuner. 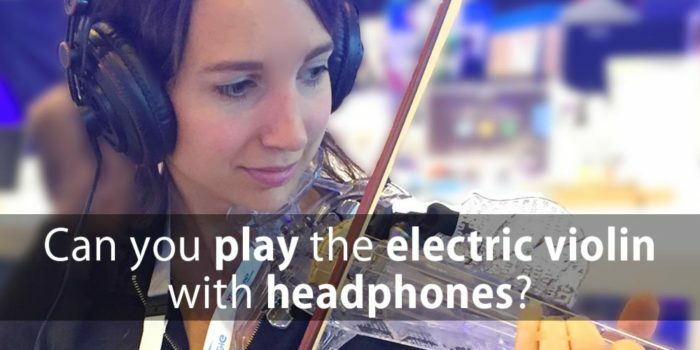 Once your electric violin is plugged in, just select it to tune your violin. Besides, it’s quite practical in the middle of a concert if you happen to feel that a string has slightly detuned; you just have to select it between two songs and discreetly re-tune your instrument. Well, it’s certainly not a given for everyone! But if you have perfect pitch, then there’s no need to use any of these tools! Trust your hearing! 3. How to tune your violin? 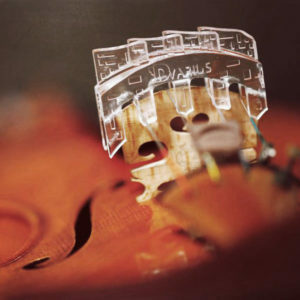 We will look at two cases, the case of the classical violin and the case of the electric violins made by 3Dvarius. Many beginner violinists are uncomfortable when their tuning pegs have to be turned and they squeal loudly. The fear of breaking a rope is very real. 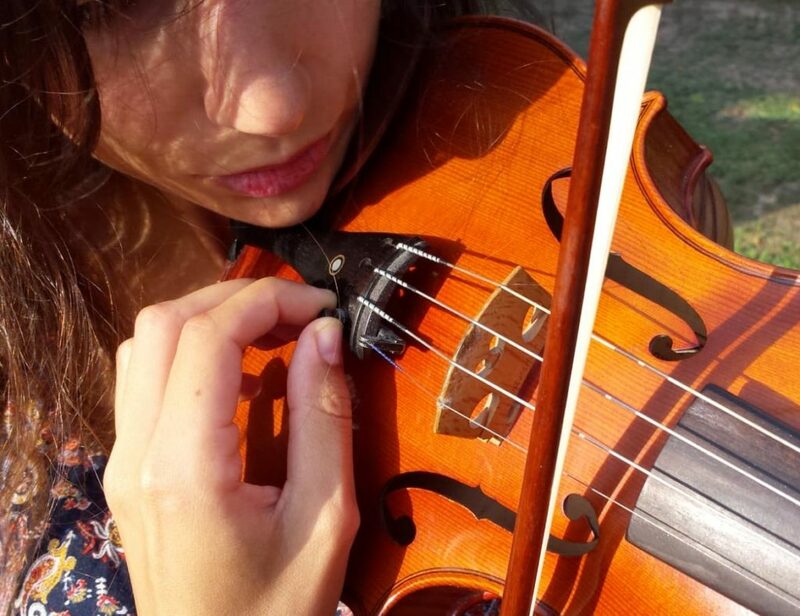 And yet with a little practice, tuning your violin is nothing but child’s play! We consider that the strings are already well installed and wound around your tuning pegs or machine heads. 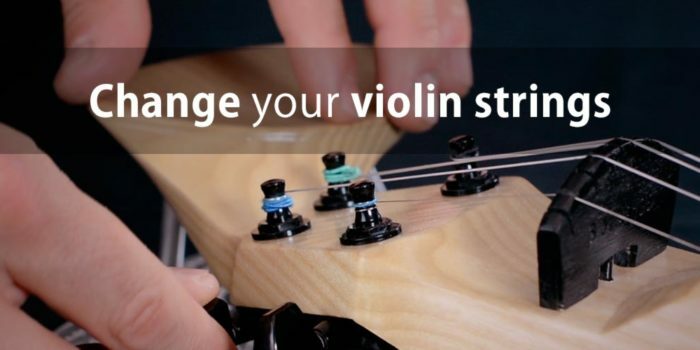 If you need to change the strings of your violin, refer to our article: how to replace the strings of a violin? Choose one of the tools to tune your instrument. You can tune a classical violin while sitting or in playing position. We think that the sitting position seems more appropriate for a beginner. Sit down and place the instrument in front of you on your lap. Slightly loose the tuning peg from the string you want to tune. Then turn it to reach the desired note. Test the sound produced by the string by plucking it with your finger. Pay attention to the rotation direction of the tuning pegs. Once you have found the target note, push the tuning peg back into its place so that it locks and holds the string. If your classical violin has fine tuners at the tailpiece (see image opposite), use them to adjust the pitch. They allow for greater accuracy when reaching the target note. Repeat these steps string by string. 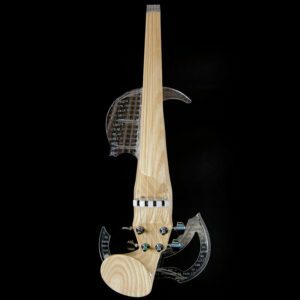 Our electric violins do not use the traditional classical violin tuning pegs. We have chosen to relocate the classical violin pegbox to redistribute the weight of our electric violins. Hence, we use tuning pegs from guitars to hold the strings. This makes tuning even easier and more durable! You can tune your electric violin by placing it flat on a table or in a playing position. As with the classical violin, a beginner will be more comfortable by placing the electric violin flat on a table. Identify the desired note by turning the guitar machine head of the string and plucking the string with one of your fingers. Pay attention to the rotation direction of the guitar machine heads. 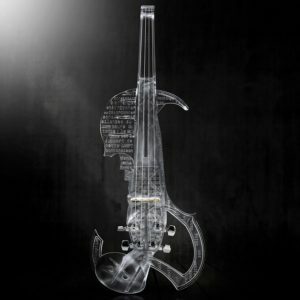 The rotation direction of the machine heads is reversed according to the position of the machine heads on the violin body. There’s nothing else to do with the guitar machine heads. They are ideal and have the advantage of better maintaining the string in tension. Hold your electric violin between your chin and shoulder. Refer to our diagram to find the ideal position for your hands to tune each machine head. Hold your bow with your right hand and turn the guitar machine heads with your left hand until you reach the desired note. If the string in question is new, it is normal for it to be quickly out of tune at first. If after several hours of playing, the problem persists, contact your luthier or manufacturer. A string that breaks when tuning! That happens, especially if you hadn’t replaced it for a long time. A worn string can break as soon as it is re-tuned. The strings are subjected to enormous tensions, they must be of good manufacture to be able to resist. Choose good quality strings and avoid the very inexpensive ones. If you break your strings with each tuning, there is another problem. Either you overstretch your strings and they break, or your violin has a problem that damages them to their breaking point. In this case, you will need to visit a luthier. A classical or electric violin will react to external conditions. Depending on the ambient humidity and temperature, the violin body and strings will adjust. This is why every musical instrument go out of tune. The material reacts to external conditions. 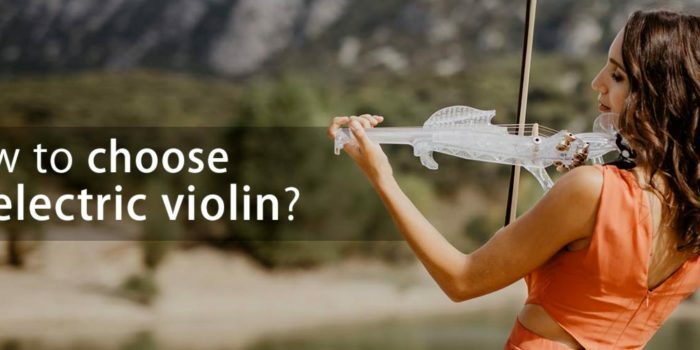 This applies to all types of materials, so even the body of the 3Dvarius, our electric violin created by the 3D-printing technology, reacts to external conditions. If you have just replaced your strings, be aware that new strings adjust faster. They tend to go out of tune in a short period of time. Of course, after several hours of play, this syndrome will disappear. The bridge is not fixed on any violin, it is held in place by the tension of the strings. If the string tension is insufficient, it may fall. A falling bridge is a rather rare phenomenon during tuning. Especially if you follow the basic rule: replace the strings one after the other. On the other hand, a tilted bridge is quite common. Don’t worry, you’ll be able to reposition it. You will have to loosen the strings to gently straighten it up. Read our article on this subject: how to straighten the bridge of a violin? Above all, never start replacing all strings at the same time, change them one after the other in order to keep the tension on your instrument constant. When travelling by plane, loosen your strings. 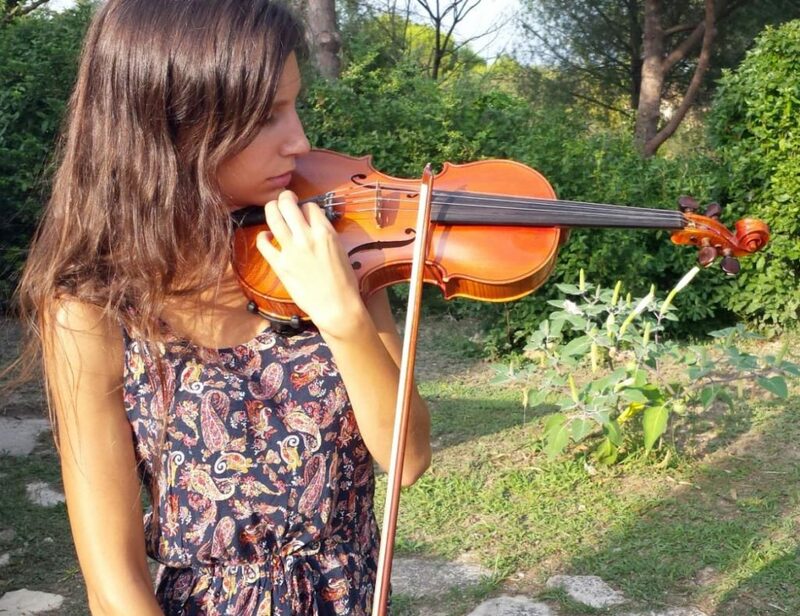 Discover our tips on how to travel with a violin. A constant over-tension of the strings limits their life span and inevitably leads to over-tension and breakage.